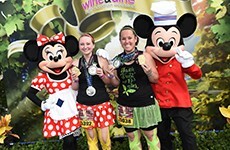 Join the celebration and prepare to feast on an exciting menu of races during the Disney Wine & Dine Half Marathon Weekend presented by MISFIT™! We are serving up the Disney Fall Feast 5K, Disney Wine & Dine 10K, runDisney Kids Races and the Disney Wine & Dine Half Marathon to cap off the weekend. Plus, runners can take on the Disney Two Course Challenge, combining the 10K and Half Marathon, to earn the coveted Challenge medal. You won't want to miss this event where there will be plenty of surprises, Disney entertainment and an exclusive Post-Race Party for runners and their guests!